The John Deere Buck Sit-and-Scoot ride-on all-terrain vehicle (ATV) makes it fun and easy for children to join in the farming fun. 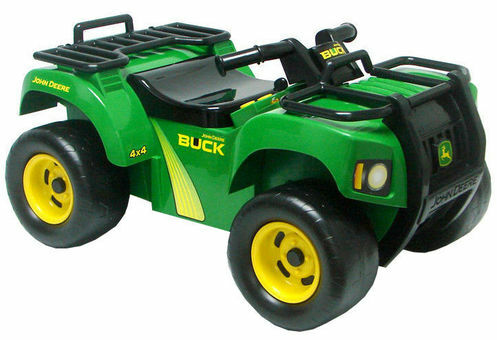 The vehicle features authentic colours and graphics from agricultural manufacturer John Deere, makes realistic sound effects, plays music, and even has flashing turn signals (batteries included). It also has pivoting front and rear racks for carrying loads. Suitable for children aged 12 months and over. Ride-on model of John Deere all-terrain vehicle. Decorated with authentic John Deere colours. Makes authentic sound effect and plays music. Features working turning signals for more realism. Carry loads on the pivoting front and rear racks.